This week saw the last of a long line of Listeners from BeRo, following his death in January. His puzzles have ranged from Dryden, Donne, TS Eliot and Heraclitus to Sudoku and the pub drinking game Fizz. This week we had the love of the number 13, although Chambers only has its counterpart ‘triskaidekaphobia’… fear of the number 13. There was a lot going on the preamble, most of which related to the endgame once the grid was complete. If I’d wanted to, I could have had a peak ahead at part of the theme by extracting the ’10th letter of 10 consecutive clues’. Of course, since everything was in base 13, this was the ’13th letter of 13 consecutive clues’. I must say that the inclusion of the phrase ‘don’t panic’ was a bit of a giveaway, with DOUGLAS ADAMS being the writer formed by the C (12) clashing letters†. Anyway, I decided to go through the clues in order, a habit I’ve got out of recently. Unfortunately, my knowledge of Ecuadorian fruit is lacking, so 1ac passed me by, but getting 6 REBECCA, C (really 12) ABELE and 10 (13) GAEA was encouraging. I was pleased to get 13 (16) Jerk, New Jersey man, New York finally backs (4) KNOB. However, by this point I’d encountered four American states in the clues, and I thought BeRo was trying to tell me something. A quick scan of the remaining clues identified nine more, and they were, of course, the 13 original American states, represented by the stripes on their flag. The solving progressed smoothly. I wasn’t even phased by the 48% in clue 19 Note New Hampshire’s latest Government edict, 48 per cent cut refused (7) where 48% was really 60%, nor 1Adn 3B with Miss Farmer’s assistant (8, two words) where 3B = 50 = L.
A couple of clues gave me a bit of a problem, especially 14ac Taking south, not north, man’s lost bearing (4) which led to WEST from WENT (lost) with S for N; I wasn’t particularly happy with ‘lost’ defining ‘went’ and the man seemed superfluous. Never mind, it was stuck in my head and I stick it in the grid††. 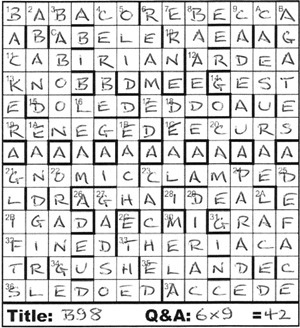 As the solve progressed, I was also worried that the clashing letters included some Es and Rs, none of which appeared in Douglas Adams’s name. Moreover, I couldn’t think what the preamble was referring to with a reference to one of his works containing a ‘striking thematic example’. Eventually, I had a completed grid. The clashes were finally resolved as E G E R L G and O R L E W O, and it was †GEORGE ORWELL and he only wrote one book with a number in it that I recall: 1984. However, I was puzzled that it didn’t have 13 as a factor, so in what way was it thematic? A bit of head-scratching came next, assisted by a cup of tea. One of the rules in my Listener Crossword Help Manual is to look for strange or significant words in the preamble. This week it was that use of ‘striking’ to describe the thematic example, and, of course, that clock striking 13 in the first sentence of the novel didn’t take long to come to mind. All we had to do was covert 1984 to base 13 to get B98. Time to identify the 13th letters in 13 clues. (Actually, I did cheat and did this about two-thirds of the way through the grid when I came to a bit of an impasse.) I wasn’t surprised to find, in clues 21ac through to 1dn, Six x nine, Adams. This relates to The Restaurant at the End of the Universe where Arthur Dent, trying to determine the question to which the answer is 42, pulls random tiles out of a Scrabble bag and gets “What do you get if you multiply six by nine?” Rather than being wrong, this is actually 42 in base 13. Finally, it was time to divide up the grid. I liked the word ‘notionally’, which meant that we didn’t have to use scissors to physically mutilate the diagram. I read it that we didn’t even have to (indeed, shouldn’t?) delineate the 13 shapes in any way. It didn’t take too long to work out the shapes. The top left corner was a bit of a giveaway with all those As, Bs and Cs. And obviously the middle row was all As. What an excellent final puzzle from BeRo. There were so many steps along the way, all coming together nicely at the end. He will be sorely missed. This entry was posted on 8 May 2015 at 4:00 pm	and is filed under Solving Blogs. You can follow any responses to this entry through the RSS 2.0 feed. You can leave a response, or trackback from your own site.